This was taken at a local home center that is less than two years old. Name the NEC violations! Are those xfmrs with the disconnect between them? Maybe this was wired by the industry 'professionals' that work there? Sorry about the poor picture quality. Yes they are transformers, and no they are not braced. They are also about 18ft in the air. 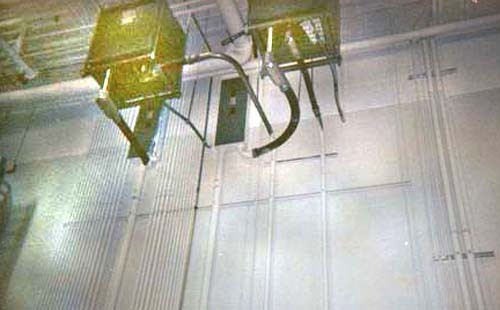 The secondary over current protection, enclosed circuit breakers are also mounted about 18ft in the air. Not very “readily acceptable. (240-24). I think this also violates 380-8. Some of the disconnects in the store are directly behind the transformers. While it appears from the ground some might meet the clearance requirements in 110-26(a)(1) they have the secondary feeding them from underneath with seal tight 90’s. You couldn’t stand in front of them if there was a platform. Most of them don’t have a chance of meeting 110-26(a)(2). What I really find odd is they went out of their way to provide secondary over current protection for these transformers and just made a mess of it. All the while the panels are directly below them and if equipped with a main could have eliminated the enclosed breakers all together. It looks like they could have meet the 25ft maximum length allowed for transformer taps. I realize that that rule was left out of the ’99 code. But it’s back in for “02! Any inspector that was sharp enough to catch that rule surly would have caught the rest of this stuff. Who knows what lurks inside!